Space weather affects a range of human endeavors—including telecommunications, GPS navigation, and satellite orbit tracking—because of its influence on Earth’s upper atmosphere. LASP scientists are particularly interested in improving our understanding of solar output and its effects on space weather through accurate measurements of the creation of computer models. Solar UV radiation is a primary energy input to Earth’s atmosphere. 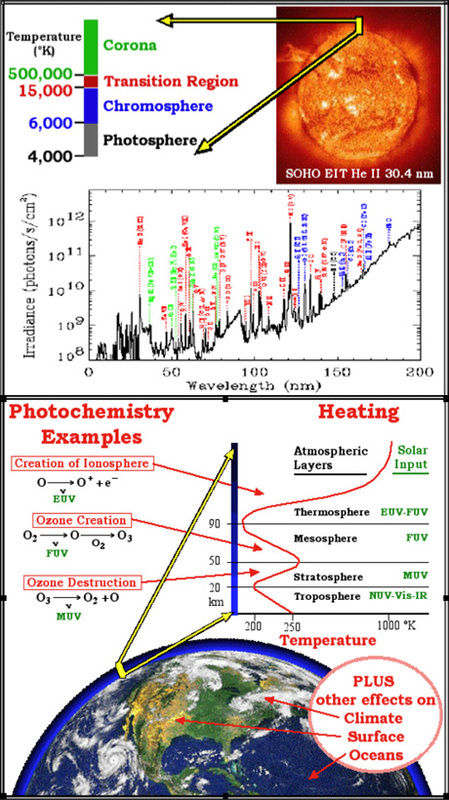 High variability in the solar output in the UV directly causes variability in the temperature, density, and composition of the upper atmosphere. How does incoming UV affect the atmosphere? UV light is absorbed in the upper atmosphere, heating the thermosphere to temperatures between 500 and 1,500 Kelvin. Solar UV also ionizes atoms and molecules in the atmosphere, creating the ionosphere. Some UV light can dissociate the molecules, breaking them apart into atoms or smaller molecules, and thus initiating complex chemical reactions and changing the composition of the upper atmosphere. The spectrum of the Sun in UV light consists of emission lines and continua that have their origins in the outer layers of the Sun: the chromosphere, transition-region, and corona. These layers of hot, ionized gases are strongly influenced by solar magnetic activity. Temperatures can range from 10,000 Kelvin in the chromosphere to a few million Kelvin in the corona. With improved measurement and analysis of the Sun’s variability in the UV light range, scientists hope to improve our understanding and even ability to predict the space weather that affects us here on Earth.